Mark Shea is wound up. Perhaps to much caffeinated chocolate. Try the carob Mark. But then again, I agree with you. …not a painting, not a scorch, not a photograph. That’s cuz it’s the real thing. Challenge to Skeptics: If it’s medieval forgery made by and for primitive suckers then get with the program. We live in the 21st century. There’s nothing technological a medieval could do that we can’t do ten times better and faster. So make another one. But do it using the 14th century tech you say created this. And don’t give me this piece of carob on the right…,,,and call it chocolate. If that thing on the right is a “reproduction” of the Shroud then Justin Bieber is Enrico Caruso. Not that Catholic faith rests on the Shroud. Millions of Christians have lived and died never so much as having heard of, let alone seen, it. But such grace notes are kindnesses from a God who, under carefully controlled laboratory conditions and despite advice from the finest ideologues money can buy, does whatever he feels like. No, but possibly a ‘chemograph’, obtained using then state-of-the-art 13/14th century alchemy (calcining of metal sulphates and nitrates to obtain nitric acid fumes). I’ll describe in detail how it was obtained in my next blog posting (which may take a day or two). For now let’s just say that a viscous dispersion was made of white flour in hot water that was then painted onto my brass crucifix. A negative image was imprinted onto linen that was then allowed to dry (becoming near-invisible). The imprinted linen was then suspended overnight in a jar filled with nitric acid (HNO3) fumes. The linen turns a beige colour (aged look?) with the faint yellow-brown imprint you see above (the photo has been autocorrected in MS Office Picture Manager). There was no appreciable reverse side image, possibly because the swollen gelatinized wheat starch granules still have some kind of particulate properties, making it difficult to penetrate the weave. These are early days. There’s a vast number of changes that can be rung with this ‘nitric fumigation’ model. I’ve briefly tested the effect of increasing the NOx content in the fumigation jar (by adding copper wire that generates visible NO2 as red-brown fumes, and no doubt invisible NO as well). The extra NOx does not appear to improve on the mainly HNO3 -developed image you see above. Note the parallel with pre-digital photography, using a developing agent to produce a visible image. That allows for constant visual inspection to achieve an optimised end-result, unlike ‘hit or miss’ contact-scorching with a heated template. As I say, it’s not photography, but chemography. The technique could be adapted to work with a real person, needless to say, pre- or post mortem, though the first of those might object to being painted with goo, even edible goo. Chemograph…love it. Whether one is pro-medieval or pro-1st century your experiments are rich with possibilities. Wait till you see the ‘proteograph’ David (same HNO3 developer). Be sure to aim for a 12-foot image with about the same body and facial details as the Shroud. Otherwise, small approximate representations avail nothing…..
Now don’t forget to hurry on down to Jerusalem and Edessa to gather pollen which is only found in those areas, and place the pollen around the head of the image. The primary proposition being tested in my programme of experimentation (now into its 4th year, with 9 working models and/or variants thereof to date, each tested experimentally) is not primarily whether the Shroud is medieval or first century. The proposition being tested is that no medieval technology could have produced the TS image (highly superficial, negative, 3D enhancible, no fluorescence under uv, no reverse side image etc etc). Pollen etc has to take a back seat while one addresses the preemptive claim for ‘non-forgeability’, as made here yet again, this time by Mark Shea (the subject of this posting, John Klotz please note). Leon- so is this the inside story of how Max Frei did it? Can’t say I welcome back Colin primarily because his post is totally off the mark. The thrust of the TOF post was history, not science. I look forward to informed comments in this chain on history pre Lirey of the Shroud including expected skeptical denials. – even from Colin. I would hope the skeptics would supply reason for that refutation of the history discussed at length in the TOF post with something more than invective. One of the comments on TOF blog itself was the claim that the posting had plagiarized Markwardt and Scavone. That would be difficult because Markwardt and Scavone have a scholarly disagreement about the timing of the arrival of the Shroud in Constantinople. Markwardt places it there earlier than either Scavone or Wilson has written. Moreover, you can’t plagiarize history. One case on that point was Harry Lincoln’s ill-fated lawsuit against Dan Brown. Lincoln was one of the four authors of Holy Blood Holy Grail (HBHG). He claimed that Brown had plagiarized HBHG in the DaVinci Code because he wrote of the Knights Templar having possession of the Shroud at some point. Brown won the law suit because of a very simple legal proposition: You can’t plagiarize history. What can’t be plagiarized are the author’s words if they are uniquely his or hers. Brown, Scavone and Wilson are writing historical texts. Any event that they report as an historical event can be reported as history by another author, but the second author can not do so in the original author’s unique own words without attribution. Incidentally, to accuse an author of plagiarism without a factual-legal basis might be actionable slander. For example, I quote Tacitus, Boris Pasternak and Elaine Pagels in quotations of paragraph length or more in my book Quantum Christ with proper attribution and in Pagel’s case with her explicit permission. The other two authors were deceased at the time of my writing. Were someone to criticize me for saying I plagiarized those authors, that would potentially be a slander. Were they say I had just copied Tacitus or Pasternak, that would not be slander. One omission from the TOF post which is very relevant is a discussion of the Justinian coins that demonstrate “Vignon markings.” Both Wilson and Markwardt have written of them. You can read or download Markwardt’s presentation at the 2014 St. Louis conference at http://www.shroud.com/pdfs/stlmarkwardtpaper.pdf It is documented with 251 footnotes. Skeptics beware! The case of the century! So long as John does not file it in the Italian courts -he will be fighting it for the rest of his natural life and beyond- and I assume that Stephen Jones will be called as an expert witness. For some reason I commented here on another post which I recommend. Apologies. But it was a great post. None of these three has any standing within the academic community and so ‘any event they report as a historical event’ would not be taken seriously unless it was a date or whatever that was already common knowledge. I am unaware of any original research by any of these writers that has been taken seriously by any historians working in these fields. “Professor Daniel Scavone graduated from Loyola University in Chicago, where he earned a B.A in Classics and a Ph.D in History. He has taught Classics (Greek and Latin) and Ancient History at Loyola College in Montreal, and from 1970 to his retirement in 2000, he was Professor of European History at the University of Southern Indiana in Evansville. At USI he taught world history surveys, and courses in ancient Greece, ancient Rome, the Middle Ages, the Renaissance, and the Reformation. He also taught upper-level courses in the Ancient Near East, the Age of Augustus, and Primitive Christianity. But CF says that he has no standing in the academic community!!!??? Riposte: I am unaware of anything that Charles Freeman has written on the Shroud of Turin that can be taken seriously by anybody!! ‘Have never met’,etc…..Perhaps you don’t move in the right circles,DaveB! I have not yet anyone who takes the Pray Codex claim seriously. ‘Where are the bloodstains on the body, where are the images? ‘ are the Immediate responses. Similarly I have never met anyone with any forensic background who believes the red marks in the Shroud are dried blood. I think Barrie Schwortz was naive to rely on a single ‘test’ by Adler which has never been replicated anywhere. Nor has anyone I have discussed this with seen dried blood as red as this in any context. So really DaveB, perhaps each of us moves in circles that are too small. I have been a professional historian for over forty years and Dan Scavone’s work on the Holy Grail is, let us say, not up to it as serious history. Your tendency to quote your anonymous colleagues who agree with you is getting a bit old. The burn holes are the finger prints of the Shroud. They were fequently replicated in copies of the Shroud. The difference between the Shroud and the copies is that holes are really holes in the Shroud and were surrounded with rings of charred material. As commentators on this blog have noted, the odds are that the repetition of the burn holes on a depiction of the burial of Christ is not related to Shroud are astronomical. And since you are an art historian, please, cite us any other works of art that display that pattern of holes which precisely match the pattern of the burn holes on the Shroud. P.s. If you want to be taken seriously by other historians, you don’t start off an article as Dan Scavone did by saying that you take Ian Wilson’s 1978 book as your Bible. It immediately marks you out as a dependent on other research which in Wilson’s case is considered laughable outside the Shroud community. I don’t think DaveB ,and perhaps others, have yet realised that no one in the academic world takes these guys seriously. I am not an historian but I’m very interested with history and I’m happy to read your comments on this blog. You certainly rocked the boat with your Turin shroud made for medieval Easter ritual theory. We will very soon commemorate the 100th anniversary of the Armenian Genocide. I guess that you agree with those who say that it was indeed a genocide ? History is no longer taught at A-level courses in some countries and I regret it. I may conclude from the above exchange that it seems the accepted practice in the academic community that if one historian wishes to attack the work of another historian, fully qualified, who has taught history at a reputable college, and indeed has been a professor of history at a reputable university, with numerous works to his credit, but the first is unable to muster sufficiently strong arguments against the work of the second, it is permissible instead to besmirch his character by claiming that he should not be taken seriously. And presumably in the academic community this may be decorated with the euphemism of true scholarship!!?? Mark Shea is always too wound up. But, for once, I agree with him. Come on, Colin. Are you comparing your results to the Shroud image? There is a lot more work to do to try and get there. Comparing my model systems feature-by-feature with the TS image checklist is what I’ve been doing for over 3 years Louis. That’s some 250 postings on my own sites, and many hundreds of comments on this one. Thank you for reminding me that more still needs to be done. Hugh seems to have misunderstood the interview with Paolo Di Lazzaro. He never said that it was radiation, neither did I. I wrote “radiation-like” because laser was used in the experiment and I simply do not believe that only the dead Jesus could have been baking like a piece of bread in an oven, or that “impurities” and what not could have produced that image. It would be like saying that the hundreds of other crucified Jews were all neatly buried, washed with the best soap to become spotlessly clean and then placed in air-conditioned tombs. One thing must be kept in mind: If it IS Jesus, no amount science will be able to determine what exactly happened. Oh, let’s not go through all this again. UV laser beams are a form of radiation. Not-radiation like, radiation pure and simple. Radiation like light is radiation, or infra-red or microwaves, It’s all radiation. What is the title of di Lazzaro’s paper at acadamia.edu? It’s “Deep Ultraviolet Radiation Simulates the Turin Shroud Image.” Di Lazzaro knows that UV is radiation, he uses the word radiation in every paper and newspaper article in which he features. Radiation is a common word; this is what it means to scientists, like me, and di Lazzaro: “the emission or transmission of energy in the form of waves or particles, including electro-magnetic radiation such as radio waves, visible light, UV, and x-rays.” If you do not think di Lazzaro’s experiments used radiation, then you are using the word in some peculiar and individual sense which only you understand. Possibly you think radiation refers only to heat, or only to nuclear disintegration. If so, then you’re wrong. What is meant is that radiation, or a radiation-like energy, which is the term I like, was the best means found to generate an imprint similar to what we see on the Shroud. Now this certainly does not mean that Dr. Paolo Di Lazzaro believes that the image was produced by radiation. UV radiation is radiation. Not something like radiation, whatever term you like, but actual radiation. di Lazzaro has achieved Shroud-like discolouraton using radiation. Whether he thinks his method was the one used to produce the image I couldn’t say.I think he would like to, but admits that the production of sufficient amounts of the sufficient type is currently beyond the reach of science. Light is radiation too. Depending on the chemical composition of where it falls it darken or it can bleach. When they did the multi-spectum digial imaging of the Mona Lisa they had to use a soecially designed light source that would not damage the painting. “Light is radiation too.” It is indeed. See my comment a few lnches above. 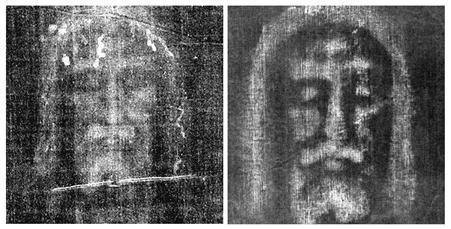 The trouble is that di Lazzaro and similar specialists in different kinds of radiation have not been able to produce the same degradation as is shown on the Shroud using visible light. So far, only UV will do, but further experimentation may widen the range. I trust you have read Dr. Paolo di Lazzaro’s description of his experiment and all that we know about the Shroud. Now let us go to the bloodstains, which have been the object of controversy. My suggestion is that if Turin allows another hands-on examination of the Shroud the same should be done with the Sudarium of Oviedo simultaneously. No, let’s not Louis. Science works by reduction wherever possible. I see no reason to discuss blood at this precise moment in time when the focus is on the body image. As it happens my new model accommodates the apparent blood-before-image sequence of events. The gooey imprinting medium is painted onto the subject first, followed by blood. On imprinting, the blood ends up UNDER the body image. That’s another tick in another box. PS: I thought journalists were specifically trained to eschew turning interview write-ups into hagiographies. I think you know what I mean. All right, let us go step by step. You said that the gooey imprinting medium is painted onto the subject first, followed by blood and that the blood ended up under the body. 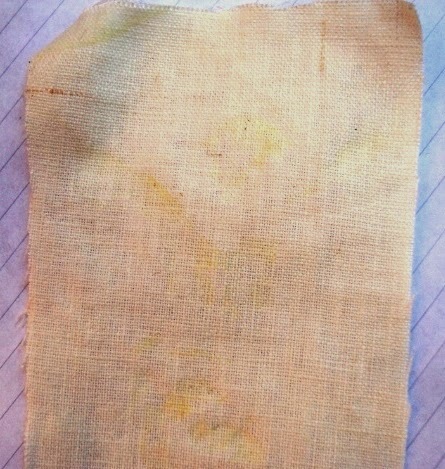 The problem is that no blood was detected on top of the body image of the Shroud. You get me? Please, hagiographies don’t interest me, exception taken to the lives of Thomas More and John Fisher, at your end, which were found fascinating. I think it is correct to concentrate on one particular experiment — NG also thought so, after me — but to emphasise that research is not hagiography! Nope, I don’t. Think about it Louis. What goes onto the imprinted subject last transfers to the linen first. I got what you mean, Colin, but only to a certain extent. Do you mean that it works that way only with linen? Not long after I began writing on developments in the chemical, dye and pesticides industry my director thought it would be better for me to also learn something about the printing process. I therefore had to work as printing supervisor and learnt enough about the printing process during the period. Of course, we were printing on paper, not linen. Have a look at the link below, which will take you to screen printing, go to no.5, which refers to printing garments. Why is it different with linen? Well, I’m going as fast as I can Louis, but the conc. nitric acid only arrived yesterday afternoon. Come evening I was thinking all the predictions were wrong, but after leaving overnight, the predictions were duly realized, at least in principle.Slow image formation is an advantage – allowing for better control and optimization of end result. Yes, I’m interested in differences between linen and cotton, mainly on account of the presence and absence respectively of chemically reactive hemicelluloses that are a prime target for the agent(s) that produced the image.Might hemicellulose degradation in the SCW as well as PCW of linen fibres explain Rogers’ reported weakness of TS image fibres v non-image fibres? Sulphuric acid weakened linen, but not cotton (recent posting on my site). What about nitric acid? Same finding. It was possible to tear the nitric-acid treated linen (albeit with considerable force), but not the nitric acid-treated cotton. The discoloration by nitric was arguably greater with linen, looking at before-and-after comparisons. I haven’t checked out cotton as a recipient for an imprinted image as yet, the chief interest being linen for obvious reasons. There is no hurry, Colin, take your time. Forget the acid for the time being, concentrate on the blood below the print we were discussing. I only understand the basics in printing, yet have never seen anything like what you describe. What you are saying is that linen acts like a bloodsucker! Let me spell it out for Louis. One paints a person or effigy thereof with a gooey substance that after chemical development will provide the body image. While the goo is still wet and tacky, one adds trails and dribbles of blood on top of the goo. One then stretches linen over the body and presses. One removes the linen with its two separate imprints – body and blood. The blood stains on the linen are now UNDERNEATH the imprinted goo. After developing (to change goo into yellow pigment) one finds there is NO yellow body image underneath the bloodstains, It looks for all the world like a pre-bloodied man left a later body image on linen. But he didn’t – not in my model. Why would someone go to that length to put the blood above the image in the Middle Ages? What is he/she trying to accomplish without proteolyses to remove the blood and a microscope to examine the fibers beneath the blood stains? MikeM: it’s well over a year since I decided to think less about scorch, and more about sweat (simulated), even if I was reading more into that Veronica-like vignette on the Machy Mould and accompanying “SVAIRE” than others. One can have the right ideas for the wrong reasons and vice versa. That’s science bizz. Prior to that, the blood-first-image-second chronology had been a huge embarrassment for the scorch hypothesis. In a forgery scenario, one needed the image first in order to know where to apply the blood, and I made no attempt to wave aside the problem. not “going to great lengths” as you put it. It’s a simple straightforward way to end up with a combined blood/body image that is consistent with the deposition of a crucified man into Joseph of Arimathea’s linen (straight from the cross in fact, before transport to tomb, with the linen acting as a makeshift stretcher, as reflected in a lot of medieval art, or indeed as up-and-over ‘body bag’ in modern parlance, it being the decent thing to do to a deceased and bloodied man while spectators are still present). No, the forgers would not have been in the least bit concerned about the fact that blood image was under body image, or have given it a second thought. All that mattered from a practical standpoint was successful transfer of blood from subject to linen despite the presence of an ‘undercoat’ on the SUBJECT (not final linen) of body-imprinting goo. Reminder: in the current model, goo and blood are being applied to the subject, not the linen. In passing, note the different geometry vis-a-vis Luigi Garlaschelli’s frottage model, where the linen is laid over subject first, then powder or slurry applied piecemeal onto the top surface under constant visual surveillance (“No, add a bit more there…). That is not pure ‘passive’ imprinting technology in my view, the prolonged manual moulding tempting the operative to add ‘artistic’ effects that are not possible when the two imprinting media are out of sight UNDER the linen. There’s then a real risk of going “too far round the sides” and risking excessive lateral distortion, os which there’s some on the TS , but very slight and not immediately apparent we’re told. Colin, it is not like that on the Shroud. Only serum rings were detected because of the image/blood overlap. “Forget the acid for the time being, concentrate on the blood.” No, please don’t. It took long enough for the acid to arrive; goodness knows how long you’ll have to wait for blood! if I were an artist and came up with a cloth that looked as bad as the shroud does (positive image) I would have thrown it in the garbage can. Hi Paul – you are absolutely correct. How many can understand your statement. Here’s a result that hot from the press, well, ceramic hob actually, just 20 minutes or so old. 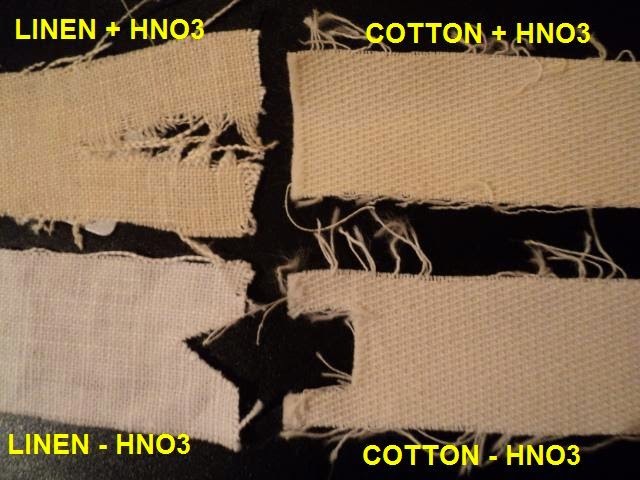 The paler samples are untreated linen, the scorched or charred ones are the same linen after fumigation with nitric acid. (Control and treated linens were then washed and dried before use). The treated linen is far more sensitive to external heat. That’s 3 tests in all, one in progress, two completed. Can anyone guess what prompted this experiment, which ended after a couple of minutes with the predicted results, both with slow and fast delivery of heat? Clue: think hot pokers (allegedly). Think 16th century fires that somehow managed to produce extensive charring of linen inside a silver reliquary in which oxygen was probably in short supply (but nitrates supply their own oxygen). about your linen fibrils under the control of the microscope? presentation of his new book written with Fasol: “Luce dal Sepolcro. Do you know the anthropologist Vittorio Pesce Delfino? those obtained in this manner. with respect the other textile samples. What is your answer about this kind of Lab test? Am I annoying with my idea to test linen fibrils? (The Hebrew University of Jerusalem). They are also able to use molecule force spectroscopy measurements. reality inexplicable using the tools of science and history. “). All very challenging, piero, maybe too challenging for this experimentalist. I ask simple questions, like “Might it be a contact scorch?”, and if not then “Might it have been produced by an acid?”, and if so “Which acid?” and having settled on an acid (nitric in preference to sulphuric) then “Under which conditions?” Was that acid available in the 13th/14th century (YES!) and was there someone with an incentive to fake J of A’s linen using that (then) state-of-the-art technology? Paul of Taranto, using Pseudo-Geber technology? Maybe Paul of Taranto WAS Pseudo-Geber. Step by step one makes progress (one hopes). It’s painfully slow, admittedly. But experimentation helps de-clutter the mind of fanciful ideas that may look plausible on paper, but if unrealistic and failing to deliver need to be dumped ASAP. I purchased a glass vessel today, looking for all the world like a goldfish bowl. It’s large enough to move my project forward, from imprinting off a brass template (crucifix) to imprinting off my own hand, using wheat flour gel as imprinting medium and nitric acid fumes (natch) as developing agent. Thank you for your interest. I’ll try to keep this site posted, though it means waiting for relevant postings or comments to appear.